We’re just one month away from TADHack-mini Orlando, at Catalyst Spaces on 25-26 March. Its going to be a unique, can-not-miss event. This weblog provides a summary of all the amazing local help we’re getting in putting TADHack-mini Orlando together, why TADHack is unique, and some guidance in prep for TADHack-mini Orlando. Code for Orlando aims to fix problems in one of Code for America’s three Focus Groups: Safety and Justice, Economic Welfare, and Healthy communities. You can read more about the focus groups here: https://www.codeforamerica.org/what/focus-areas. Erin and Andrew (Co-Captains of Code for Orlando) are working with us to help developers use the TADHack sponsors’ technology to make a difference for Orlando! Orlando Tech. Diane Court and her team have us listed on their event schedule, http://orlandotech.org/events/, and promotes us across their community. IOT Orlando, led by Jared Mitchell Porcenaluk, has promoted us across the IoT community, and Jared will be taking part in the hackathon. We can’t wait to see his hack. Valencia College are building a team to take part in TADHack. Several other universities are promoting TADHack across their student bodies. And its not just the software / engineering departments, also the entrepreneurial / business groups. We’ll have a post coming out on the Creative Entrepreneurs Orlando meet-up group soon, thanks . TADHack is for Everyone, whether you’re a hacker, hustler or hipster (developer, business-type or designer); TADHack has something for you. Please register here, and you’ll learn about adding programmable telecoms to your apps, services or business; be able to share your experiences with others; do some “coding”; and potentially create a winning hack that can make a difference in Orlando! Enterprise Connect. For more than 26 years, Enterprise Connect has brought the top subject matter experts together with the enterprise decision-makers who build the communications that power and, increasingly, transform business. 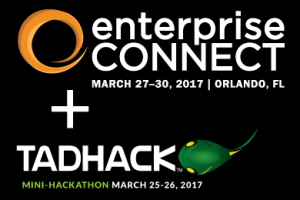 The sponsors of TADHack-mini Orlando are leaders in enterprise telecoms and proudly stand shoulder to shoulder in helping people see what’s possible now telecoms is programmable. With this hackathon the winners get a chance, if they want, to present at the massive Enterprise Connect event that runs on the 27-30 March. It will be great exposure to most major US enterprises in one place. If you want to accelerate your career or business, its a great opportunity. And don’t forget we also accept remote entries, so its not just in-person hacking, you can be in Africa, Europe, Asia or South America and take part. Unique world-first line-up of sponsors including: Cisco Spark / Tropo, Flowroute, Matrix, Ring Central, Telestax with partners DataArt and Dialogic, Temasys, Vidyo.io. There is nowhere else you can get this level of in-depth hands-on comparison. Remote entries. Its not just in-person hacking, you can be in Africa, Europe, Asia or South America and take part. We have start-ups planning showcases with mash-ups of their technology and the sponsors; we have people around the world excited about mashing up many of the sponsors’ technologies. Remote location,TADHack-mini Hatfield. Naledi Phafane, from TADHack Global South Africa last year, is putting together this remote location in at The Fields in Hatfield, South Africa, called TADHack-mini Hatfield. At TADHack our approach is open. We’re focused on developers, technology and creativity. Helping people be successful using telecom capabilities. I apologize for repeating this phrase but TADHack is for everyone. In preparing for TADHack-mini Orlando bring your favorite development tools, if you have none, do not worry, some sponsors have simple graphical tools you can use, you may join a team where some people may have a preferred tool, and the sponsors are there to help you – ask nicely and they’ll get in and help you code Really, the techy side is secondary. The primary thing is thinking about all the problems you see in your life and those of friends, family and colleagues; have a think about how the sponsors’ capabilities can help solve those problems. Especially if they can help Orlando, see our Code for Orlando weblog. Here is an interview with a well-known uber-geek, Tim Panton, on how to approach hackathons for more guidance. We also have a pre-event meet-up on Friday 24th March, 6-8 PM. Its a chance to meet the sponsors and Code for Orlando folks, network with everyone, and we’ll help you form teams if you’ve not done so already. This pre-event meet-up is optional, you can turn-up on Saturday 25th as we’ll still run through the sponsor’s resources, and help finalize teams.